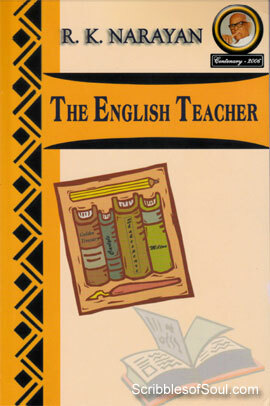 The English Teacher by R.K. Narayan is the third and the final connecting angle of the trilogy composed by the wonderful creator of Malgudi. As I read ‘Swami and Friends’ and ‘Bachelor of Arts’ and realized the easy transformation of innocent, naughty Swami into an intelligent but slightly confused young Chandran, I expected the story to continue with a married, well-placed adult as the protagonist and became all the more curious to read the third stage of life, that Narayan would unfold in his next novel. And, I must say that the prodigal author satisfied my hunger in more than one way. Not only he presented the protagonist Krishna as a married man, working as an English Teacher in Albert Mission College, but also he touched upon the void in his life, his frustration to realize his real goal, his deep love for his sick wife and his continuous urge to draw solace and fulfillment. The novel begins in a College hostel in Malgudi, where Krishna has been living for years, first as a student and then as a lecturer. Though, he is earning good money by teaching, Krishna is not satisfied with the boring routine life of a teacher, whose job is to parrot the same old poems and literature to his uninterested students. He would rather write his own poems and quench his intellectual thirst. Though, the young jovial Krishna is not a strict disciplinarian, and he only dreams about being a poet, while in reality he seldom writes. This wishful thinking, together with his ability to crack small jokes and witty one liners ensure that he is always in jovial company and enjoys life as freely as any college student would. However, a single letter from Krishna’s father changes the course of the novel. As his wife and daughter are sent to Malgudi to live with him, the carefree bachelor days of Krishna end, and he gets busy in the mundane tasks of domesticity, almost giving up his dreams, and yet being more content than ever. Till this point, I felt the book was a light read, an entertainer overflowing with intellectual witticisms. The restrained yet fantastic humour of Narayan ensured that I would not leave the novel for a minute. Though, there was hardly anything extraordinary in the book! After all, it was just a plain story of an ordinary teacher, but in the deft hands of a master creator, even the ordinary events can be celebrated as extra-ordinary. Be it the impatient wait of a husband on the railway platform, or the frantic search for a home, or even the uncomfortable disgust of a village woman, who is accidentally trapped in a toilet, Narayan shines as a literary gem, who could simply translate mundane incidents into great literary stuff. But, destiny does know how to surprise a man, and Narayan does know how to execute a clever twist in the story. So, the story takes a strange turn with the sickness of Krishna’s wife, and all the concentration is focused on convalescence of patient, forgetting about the dreams of writing, buying house, enjoying marital bliss etc. As soon as Sushila fell ill, I realized the sombre tone, the novel would acquire, fast slipping into sorrow and dismay. But, to my utter surprise, Narayan even made the sickness period come alive. He wrote about the affection and care of Krishna for his wife so convincingly, that I could not help but remember my own tryst with typhoid and the loving care showered by my father. I felt like being a part of Krishna’s life and wanted to experience his happiness as well as grief. And, it is this involvement only that could justify Narayan’s rendezvous with supernatural, philosophical connection with the dead. Though, the logical part of me could not accept that one could influence our life after death, the emotional part of me clung to Narayan’s theory of death being just a change of body. The soul is alive even after body is dead, with all the emotional threads intact, though now it can neither be touched nor be seen. But, one can surely feel it and communicate with it. I felt the same effect, a Hero has on you, when he jumps from fifteen storyed building and lands straight onto his feet. I wanted to believe in Krishna’s belief and really wished him to connect with his beloved and dreams once again. It is only a Narayan novel, that could place ordinary onto a high pedestal, and make an impossible thing to occur most normally. I must confess, I felt emotionally charged while reading this book, as well as while writing this review, and more than once ignored the slight pitfalls in my journey, though, I must say there were some. I could not fully understand the character of Krishna’s daughter’s school principal, nor was I satisfied with some of the soliloquies of Krishna, or could see much sense behind living your life on the basis of predictions made by a mendicant. But, the narrative as always was brilliant and the shock value of strange, unheard-of events made ‘The English Teacher’ click and I am more than satisfied with this book being a proud part of my small collection. Though, I must repeat, as I said earlier also that ‘Vendor of Sweets’ should also be considered a continuation of Krishna’s character as Jagan in his old age. The names change in every book, but essentially the character remains same and the four novels together can be more than enough to provide an extra ordinary lifetime story of any ordinary man. At the end, I would say that ‘The English Teacher’ is slightly hard to accept with a logically oriented practical mind, but is no less than a feast for an emotional soul! Thank you Jessica, glad you liked it. Yes, I have reviewed many stories and novels by R. K. Narayan here. He is one of my favorite writer.